Many people are afraid of sharks, imagining them to be huge fierce man eaters, spending their lives lying in wait to make a meal of an unsuspecting human being. Nothing could be much further from the truth! They are “Apex Predators”, which means that they are at the top of the marine food chain – not much eats sharks other than bigger sharks! Some are more “Apex” than others: Basking Sharks and Whale sharks, although very large, feed on tiny plankton which they filter out of the water using ”gill rakers” which they have instead of teeth. Many other sharks feed on small crabs, shellfish and octopus buried in the sand and inside holes in rocky reefs, often searching at night when their prey is asleep. 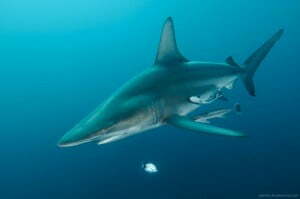 Dead or hurt animals are often targeted by scavenging sharks rather than healthy ones which are difficult to catch. Many sharks do not feed every day, some only every few weeks, some may not eat for months. Sharks that do feed on larger animals tend to live out in deeper water rather than on coral reefs. Because it is hard to see very far in deep or muddy water, these sharks use special senses to find food. Hearing: Sharks have good ears that pick up sound waves through the water at long distances. They also detect subsonic vibrations with a special set of organs along the side of the body called “Lateral Lines’, which pick up the kind of vibrations a wounded or struggling fish may give out. Sounds and vibrations attract sharks to the area where there might be something to eat. Sight and smell: Sharks can see very well in clear water, and many of them have special reflective eyes, like cats, which help them see in the dark. They smell through their nostrils and olfactory sacs, across which water can be pumped even when they are not moving. Sight and smell help a shark pinpoint the exact location of something that might be the right size and kind of food. Electrical sense and touching: Sharks have very special organs in their noses which help them detect the exact position of fish in the water or under sand. Others have “barbels’; short feelers under their chins, with which they can feel around under sand. These senses allow them to find the exact fish or animal they want to eat. Sharks are still very careful even at this stage, when the food is actually in their mouths. Many will take a shallow sample bite, and taste it with taste buds just behind their teeth, to be certain it is something properly edible. If it does not taste like food, they will often spit it out at this time, and swim away. This explains why so many “attacks” on humans are just a single bite; most sharks do not feed on mammals and do not recognise the taste of the humans to be food.